Provide comfort for the family of William Wright with a meaningful gesture of sympathy. It is with sadness and recognition of a life well lived that our family announces the passing of Bill Wright on January 3, 2019 at the age of 85 years. Bill was predeceased by his parents Clifford and Eleanor Wright, his brother Jim (Dell) and his sisters Lorraine (Duncan) and Kathleen (James). He is survived by his wife Darlene, daughter: Sandi (Jim) and son: Bruce (Karen-Maria), grandchildren Allison (Jared) and Joel (Maigen) and his great grandchildren Anna, Emily and Caeden. Bill was employed 40 years with Transport Canada, the last 20 years as manager of Flight Services at the Red Deer Regional Airport. Bill was active in the community, involved with the fastball league and volunteered with Innisfail Eagles and the Innisfail Library. He also enjoyed golf, reading (especially history) and spending time with family and friends. At Bill’s request there will not be a service. 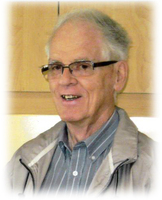 A Celebration of Bill's life will be held at the Innisfail Library on Saturday, April 13 from 2:00 - 4:00 p.m. Donations in Bill’s memory can be made to the Parkinson Association of Alberta. Address: 120, 6835 Railway Street SE, Calgary, AB, T2H 2V6. Our family would like to extend a heartfelt thank you to Dr. Barker and all the staff of Sunset Manor for the care and kindness shown during Bill’s residency. Bill will be remembered by all for his sense of humour, sense of fun and his laughter. He was a devoted husband and a great dad. We are thankful for the time we had together, he will be truly missed. To send flowers in memory of William Kennedy "Bill" Wright, please visit our Heartfelt Sympathies Store. Provide comfort for the family of William Kennedy "Bill" Wright by sending flowers. Darlene and family, it was with great sadness that I heard of WK's passing, he was a great guy and a dear friend for over 50 years. Our thoughts are with the family during this sad time.